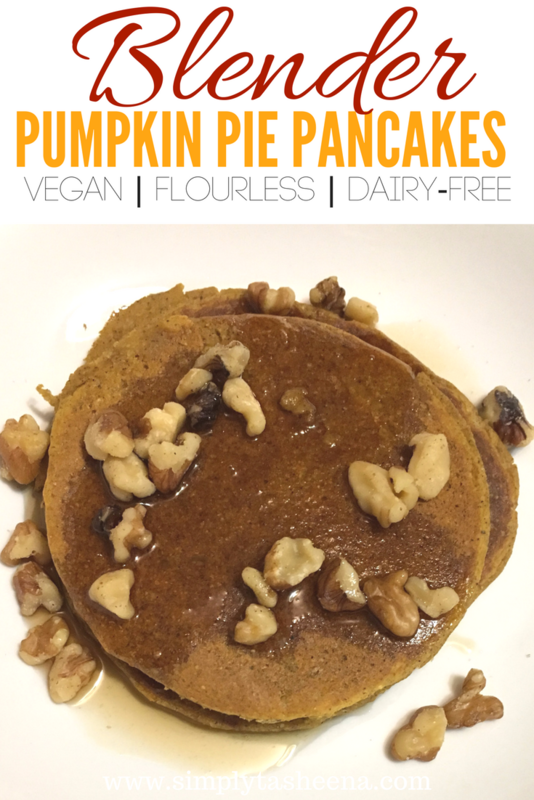 If you tried my regular vegan blender pancakes recipe. You're in for a real treat and you're going to love this Vegan Blender Pumpkin pie recipe. When I made this recipe. I had no intentions of having this for breakfast. I was going to have the norm which is my two rice cakes with peanut butter or homemade almond butter. Out of nowhere, I thought to myself. "I still have pumpkin leftover in the fridge" I knew I was out of oats and was running low on my homemade oats flour. However, I looked in the oats container and seen I pretty much had an enough for this recipe. I started playing around with ingredients and voila! These pancakes taste simply amazing! If you're looking for a recipe to make on a whim or something special for your family Thanksgiving morning. Look no further! I prefer to make my pancake recipe the day of using it. However, you could always prep the items needed for faster cooking. Are you a pumpkin lover? Serve warm and enjoy with maple syrup and your favorite toppings! I found the blog content very useful and informative, I am sure it will really help me a lot. Thank you , really appreciate it from the bottom of my heart. custom dissertation writing service for more data to minimize your further doubts on this area.